Birthplace : Gorham, Maine, U.S.
Edwin Herbert Hall (November 7, 1855 - November 20, 1938) was an American physicist who discovered in 1879 the “Hall effect” – development of a transverse electric field in a solid material when it carries an electric current and is placed in a magnetic field that is perpendicular to the current. 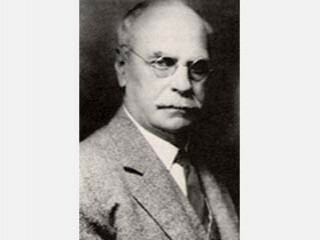 Edwin Herbert Hall was born in Great Falls (later North Gorham), Maine, and educated at Johns Hopkins University, Baltimore. He discovered the “Hall effect” in 1879 while working on his doctoral thesis in Physics under the supervision of Professor Henry Augustus Rowland. Hall was pursuing the question first posed by Maxwell as to whether the resistance of a coil excited by a current was affected by the presence of a magnet. Does the force act on the conductor or the current? Hall argued that if the current was affected by the magnetic field then there should be “a state of stress… the electricity passing toward one side of the wire.” Through a myriad of experiments and failures, Hall discovered that a magnetic field would skew equipotential lines in a current-carrying conductor. This effect is observed as a voltage (Hall voltage) perpendicular to the direction of current in the conductor. Hall conducted an experiment by putting a thin gold leaf on a glass plate and then tapping off the gold leaf at points down its length. He then conducted other experiments using various materials in place of the gold leaf, and various experimental placements of tapping points. In 1880, full details of Hall’s experimentation with this phenomenon formed his doctoral thesis and was published in the American Journal of Science and in the Philosophical Magazine. Kelvin, himself a most distinguished scientist, called Hall’s discovery comparable to the greatest ever made by Michael Faraday. The magnitude of this discovery is even more impressive considering how little was known about electricity in Hall’s time. The electron, for instance, was not identified until more than 10 years later. The production of an electric field across a material through which an electric current is flowing and on which a magnetic field is acting. The electric field, Ex, is perpendicular to both the current, jz and the magnetic field, By. The force applied to the charge carriers by the electric field exactly balances the Lorentz force from the magnetic field. The strength of the electric field is given by where RH is known as the Hall coefficient. In a classical model of the Hall effect, RH is simply 1/nq, where n is the number of charge carriers per unit volume and q is their charge. The Hall coefficient changes sign with the sign of the charge carrier, and therefore provides an important means of investigating the electronic structure of the solid state. In particular, the positive Hall coefficients exhibited by metals such as magnesium and aluminium are a clear indication that a naive picture of a sea of conduction electrons is inappropriate because the majority carriers are clearly positively charged (and are, in fact, holes). An applied magnetic field deflects the charge carriers in a material, causing a difference in electrical potential – the Hall effect – across the side of the material that is transverse to the magnetic field and the current’s direction. Above, both positive and negative charges are deflected and in both pictures, the current is up and the magnetic field is into the page. The side of the material that becomes more positive, though, depends on the sign of the charge carrier. After a year in Europe, Edwin Herbert Hall joined the Harvard faculty and was appointed professor of physics in 1895, a post he held until his retirement in 1921. He continued his thermoelectric research at Harvard, where he also wrote numerous physics textbooks and laboratory manuals. Other so-called galvanomagnetic effects were later discovered by Walter Nernst and others. Hall spent much of his later life attempting to measure the various effects as exactly as possible. Edwin Herbert Hall died on November 20, 1938, in Cambridge, Mass. U.S.A. The “Hall effect” remained a laboratory curiosity until the latter half of this century because materials available prior to recent years only produced low levels of Hall voltage. With the advent of semiconductor technology and the development of various III-V compounds, it became possible to produce Hall voltages many orders of magnitude greater than with earlier materials. Thus, semiconductor technology launched the practical design and production of the Hall sensor. The Hall effect is commonly used to control the primary circuit of an electronic ignition system. The principle is used in Hall effect crankshaft position sensors and ignition pickups to produce a very clean on-off signal. More than a century after its discovery Klaus von Klitzing was awarded the 1985 Nobel Prize for physics for his work on the Hall effect. View the full website biography of Edwin Hall.